What is equine facilitated learning? Trying to define equine facilitated learning is like trying to ask a horse to stand still in a hurricane. Even those in the industry have a hard time agreeing on whether or not it is equine assisted, facilitated, integrated and experiential or guided. This author has been exploring that question for well over a year now, and it is still cream cheese green hairy mold fuzzy. There is something potentially good underneath if you scrape on the fuzz on top. If you Google it, you will find lots of different opinions across the board of people trying to boil it down and put it into a nice neat little package to sell. It gets a little scary if you watch YouTube videos of professionals who film sessions with some questionable practices. So where is the regulation? Where can one go to find answers and a clear cut path to certification? Unfortunately there is no “one stop shopping” on this one, but there are some really good options to start with depending on which area you want to focus on. If you are wondering why you should care, think about the fact that every incident that occurs at the barn as a result of someone with more heart than experience can affect your insurance premiums or for every not so good facilitator there are strikes against the credibility of the really good facilitators. By giving framework, common language and guidelines to professionals, we help to ensure the future of our business. So let’s take a closer look by examining what we can all agree on. After several conversations with those you might consider the leaders in our industry including Linda Kohanov, Barbara Rector, the folks at E3A, and others, we find that we can all agree that this is a growing slice of the equine assisted pie. Discussions on those conversations are coming soon. We can also conclude that there are many traditional therapeutic riding instructors that are moving into a more EFL focus based on the early findings of an industry survey conducted by PATH Intl. However, if you boil down the primordial soup that makes up this industry and get to the essence of the EFL work, we find some common elements to help us build a framework around equine facilitated learning. The first is that EFL is the inclusive home to a diverse group of professionals. EFL can be applied to so many settings that it is impossible to come to a definitive list. But the short list includes coaching, education, leadership development, corporate coaching, recreation therapy, ministry and much more. The point is that is can really be applied by any professional. Another point we can agree on is that the nature of the session is determined by the goal of the client and the purpose of your session. If you are operating as a life coach, then your session would be focused on a developing the skills the clients need to achieve their life goals. If you are in leadership development then the session is focused on developing a leadership trait. All of this is through horse interaction. We can also agree that the horse is a partner, not a tool. This is a point that varies across the board as far as what language we use to describe the work. It is generally accepted that one never says they “use” a horse as it does not honor their part in the process. As Shannon Knapp, author of More than a Mirror: Horses, Humans and Therapeutic Practices says “If you can substitute a bale of hay for a horse in any activity without a significant change to the activity, then it’s not EFP/EFL. Why have a horse there?” Ethically we have to shift our mindset on how we view the horse in relation to our work. The deeper we go we find out more on the horse’s sensitivities and the grand consequences that happen. The horse can experience stress and if we as facilitators aren’t in tune enough to the signals and behavior the horse I communicating, we can do more harm than good for both client and horse. The horse is a partner in the process with the client and facilitator. Facilitating is a great word for what we do. When people talk about horse work it really is a shift from teaching in the traditional sense to facilitating. You are facilitating the conversation that is happening when in session with the horse. Yes there are times when we are teaching when we review safety and the nature of horses with our clients, but it is knowing the difference between teaching and facilitating and knowing when to use on or the other that is key. The nature of an EFL session is one that deals with the development of life skills and growth. There are those who would argue that they are teaching horsemanship skills and that is EFL. Yes that is coming from a learning point of view but it is not EFL unless the goal is development of a life skill. 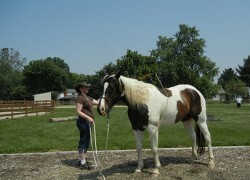 EFL is a session where clients or clients achieve goals through learning to work with horses. Through that interaction and learning how to communicate with them we are learning skills that help improve quality of life such as trust, honesty, connection, self-regulation and self-confidence. And the last point we can agree on is that it is not therapy and understanding scope of practice is paramount. 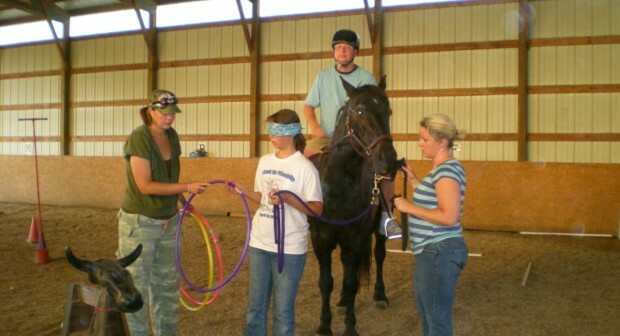 One cannot just start facilitating EFL if they are a therapeutic riding instructor or certified equine specialist. The key is to satisfy the two primary competencies: training in facilitating groups and individuals and advanced knowledge of the horse behavior and horsemanship. This does not mean that you have to be an expert in both areas. If you are facilitating the session alone then you would need to be the expert in the horsemanship side of things and have to be the expert in whatever the purpose of the session in whether it be leadership or education. If you don’t have the expertise then you bring someone else in to co-facilitate with you. This is not therapy but things come up for clients all the time. It cannot be stressed enough that advanced knowledge is required to know when you are entering the grey area between learning and therapy. You have to know when to intervene and stop the process before it goes too far and when not to intervene. And if someone opens up about something that is beyond your scope of practice, you need to know how to handle that situation. Processing and debriefing for learning is different than processing for therapy. The facilitator or co-facilitators need to understand that line to keep the horses safe and their clients safe. As far as getting certified to offer equine facilitated learning, there are a few options. 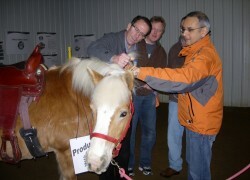 PATH has an equine specialist certification that certifies a professional in partnering with someone. But it does not teach facilitation skills. The Certified Equine Interaction Professional in Education is a competency based certification that certifies mental health professionals and education professionals for the work. It tests both horsemanship and facilitation but does not offer training. Equine Facilitated Coaching and Learning offered by Kathy Pike is a coaching based certification that is a yearlong commitment and covers both competency areas in a strength based approach. Epona Quest offers a yearlong apprenticeship training as well. It’s a bit pricey but it thorough and like Kathy explores more of the self-growth side of the work. E3A offers training in leadership and corporate work. Their foundation is experiential education and leadership development and some of the training can be done online. EAGALA is a great gateway to the work but certifies mental health professionals and horse professionals to work in teams. It does not focus on the learning side of facilitation but the therapeutic side. The deeper this rabbit hole goes the more we discover the impact of working with horses and how powerful it can be. But we are still in our infancy of truly understanding the nature of it. We know it works and it has amazing benefits but we are like children with a new toy as people set off to brand it and package it up to sell to the mass market. But like any other power it must be respected first. The horse must be honored first as a sentient catalyst for change. Those of us who are drawn to work with horses and live the horse life understand this power and how it holds us to the work. It is our job to make sure that everyone in this industry can make a living doing what they love and be responsible for protecting our horses and the clients we work with.